IT’S OUT! 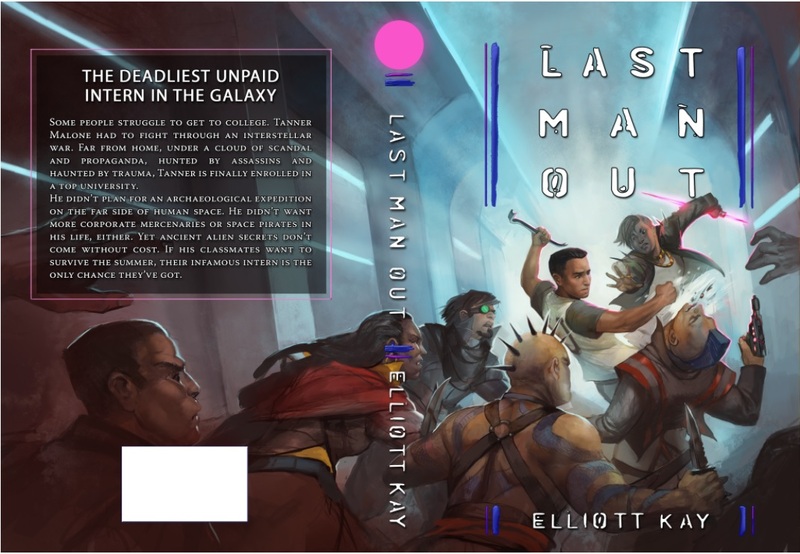 LAST MAN OUT IS NOW AVAILABLE IN EBOOK! Pick up LAST MAN OUT now! Give it a review! Tell your friends! You’re a damn good author. Keep it up. FYI – I found the book on Amazon, but it doesn’t show up on your Amazon author page. Yeah, that’s an automated thing on Amazon’s end. It can take a week for that to happen. An agonizing, nail-biting, what-if-I-did-something-wrong week. Been waiting for this. Thanks for your effort! Another 35 kilos of weaponized angst! Thank you Mr. Kay! Thanks for a great read! I enjoyed the story a lot. Hope to see more books in this series soon! Of course, if you decide to write in the Good intentions universe, I am eager to read new stories in that realm as well! Thanks for putting this in KU, but you are one of my “just buy it author’s”. I’ll start reading it tomorrow after I finish my current run through Nathan Lowell’s trader’s tales series… so late tomorrow morning! Woot!! Actually, I’ll have to re-read the first four in the series again and then read it, so… Friday! New Books ROCK, and yours have been uniformly enjoyable. I hope you are doing well and all that. Argh, now the painful wait begins. Hope it’s only a week or two. You know an author has done a good job when I skip past the Kindle Unlimited option to spend the money anyway; really love the opening up of the universe in Last Man Out. Looking forward to seeing what poor group of sods try to murder Tanner next time. Really loved it. So glad this story is continuing after the war ended. Good book, awesome job on expanding Tanner, making him human working his challenges. Also solid job on opening up the universe your characters are in, I look forward to how you further expand it out. One of my more favorite series overall also! While I was reading and seeing reminders of his…issues (trying to avoid spoilers) a song came to mind. Machine Gun Kelly/X ambassadors ‘Home’ from the Bright soundtrack. The opening line is fairly haunting for Tanners predicament: ‘Home / A place where I can go / To take this off my shoulders’ / someone take me home’ I’m looking forward to next novel to find out where this is all going. Though I’m also curious for a short story between DMD and LMO that has more info about what happened between and his friends reactions. I’m playing with a side-project right now, but I’ve got some of the next GI book already written. Not walking away from that series at all. No release date in mind yet–trying to project that only leads to disappointment for everyone, especially myself. Hope it us sometime this year! GI is my favorite series and I check all of your posts just in case there’s some mention of a new book. I read book 1 of PMF hoping it had some of the same elements as GI ,but it’s just not my cup of tea. Eagerly awaiting more news on Alex and the crew! Any update on the paperback version? The wait to be able to read this is painful. But Elliott, When will the audio book be out. Some of us don’t know how to read. Crap – it edited out my Spoiler alert sign — had around it — Ell, please feel free to delete this thread – I cant seem to edit it to add SPOILER ALERT back in. mb. Comment deleted per your request–I’m not sure how to do spoiler tags either (and I’m off to a protest)–but THANK YOU! Hope there’s an audiobook I usually wait and get it on there instead of reading it so I can enjoy it over a few days. I ship Lauren and Tanner personally and even if it doesn’t happen I won’t give up hope lol. If there’s no ETA on an audio for a while I’ll probably end up grabbing the Kindle, although it should just be between you and the narrator, I’m doing the audio on mine and I’ve sold like less than ten copies lol. Just finished it. I’m sold on Kelly now lol. Can’t wait for the next one, I was hoping tanner would go back into the navy though. Fingers crossed for a war and him getting drafted. A quick question that I’ve been curious about since I first read Last man out; by any chance did you visit Australia before writing it? Hey Elliott, will this come out as an audiobook? If yes when? If no…..please god dont let it be a no. I have loved the series and listend to it several times. Timothy Andrés Pabon is such a good narrator. I got confirmation just yesterday that Tim Pabon is on the job. No word yet on when to expect a release. I’ve made a lot of progress, but I’ve also allowed myself to get distracted by pushing on with the next novels. I am sorry about that and I will try to wrap up the paperbacks for LMO and Run Like Hell very soon. How exactly did you manage to get two of these out without me noticing either one?! Oh well, guess I’ll just have to binge read them both this week. Shoot me an email at elliottkaybooks@gmail.com if you’d like to be on the notifications list. I send everything out BCC and only send emails when I have a new release. Most social media feeds are pretty unreliable, especially Facebook. You see only what the algorithms decide to let you see on a given day.